What Is All That Stuff on My Credit Report? So, you finally took my advice and got a free copy of your credit report. Good for you! Now what? Well, if you are like a lot of people, you may be a little overwhelmed by what is on it. Didn’t you cancel that store credit card years ago? Is it a problem that it is still on there? What is all that other stuff? 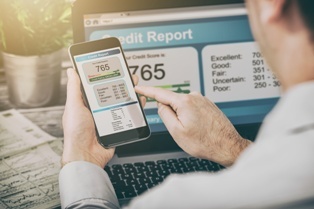 I break down what you might see on your credit report so you can find what shouldn’t be there. Personal information. Here’s where you will see your name, Social Security number, date of birth, and employment information. This information is updated based on reports to the Credit Reporting Agency from lenders, so don’t assume it is all correct. Double check everything! Trade lines. This should be the bulk of your report. Here, you will find a listing of all of your credit accounts, including credit cards, auto loans, and mortgages. Your credit limit or loan amount will also be listed as well as your payment history. Go through this section with a fine-toothed comb! If it is not your account, it needs to be removed. Public records. The next section comes from state and county courts and collection agencies. This is where you will see bankruptcies, wage garnishments, lawsuits, foreclosures, and liens. Again—make sure anything listed here is actually yours! Inquiries. If a lender or other agency has requested a copy of your credit report in the last two years, they will be listed here. This includes requests you have authorized when you applied for a loan or a credit card and requests from lenders who are researching you in order to “pre-approve” you for a card or loan. Depending on what kind of credit history you have, your report could be sparse or it could be loaded with entries. Either way, the point of requesting the report is to make sure it is all correct, so be sure to go through it. Seeing an entry for a store credit card you got to save 20 percent on a big purchase and never used again is not a big deal—as long as it shows it is paid off—but seeing a card you never had with a large balance is a big problem. Who Provides This Information To The Credit Reporting Agencies? So where are the credit reporting agencies getting this information? It is reported to them by the lender, creditor, landlord, debt collector, insurance company, or other entity who is dealing with your debt. These entities are known in CRA lingo as “furnishers” and are required to follow strict federal guidelines when they report the information. Sometimes, they mess up and report misinformation or report that someone else’s credit problems are yours. This is why it is important for you to check your credit reports every year. Who Else Can See Your Credit Report? If you see unauthorized entities listed in that last section of your credit report, you may be able to take legal action. Now that you understand your report, you might find mistakes or unauthorized usage. The CRA is obligated to correct any misinformation on your report. If they fail to do so, you may be able to sue them for damages. If you are having problems correcting your credit report, tell me your story. Contact me online or call me directly at 415.802.0137. If I can help—I will!